The most perfect speaker systems will not deliver great results if the acoustic conditions are lousy. Are you interested in improving your room acoustics? Read on. Precision and sense of detail are characteristics of each and every audiophile. To enjoy music presentation, we need something extra. Many people do not drink coffee, some soothe their appetite with instant coffee, some are simply okay with “something”. Some people choose coffee based on advertisements and brands, some prefer their own taste and preferences. Some people possess overpriced and intricate coffeemakers which produce poor results, others prefer simplicity, or understand the preparation of coffee, they know that what is important is the freshness of coffee after roasting, proper coarseness of grinding done just before the preparation of espresso, then quality, hardness of water, pressure, temperature. Then an espresso enthusiast gets exactly what they want. Knowledge, consistency, attention to detail and precision bring the perfect result. Listening to music at home is in many ways similar. Some people do not listen at all, some are okay with compact portable radios, some with a hundred dollar speaker system. A great portion of the population has not yet heard quality reproduction of music, just as they have not drunk quality espresso. Some people own overpriced audio equipment, yet the outcome is not quite perfect. In their rooms, a thing served by the seller stands proudly, only he forgot to mention the importance of acoustics. Believing their dream brand, customers end up being satisfied with a lousy result. Amongst us audiophiles, there are also people who simply follow their own feelings while listening and understand the technical details, including the substantial element of acoustics. Their listening spaces are relatively acoustically balanced, the speakers and the listening spot properly placed. The outcome is precise, perfect, just the way a quality audio enthusiast likes it. From the beginning, it must be clear that the resulting quality of listening is determined not only by the quality of the entire audio component chain, but especially by the acoustic quality of the listening space. Decent acoustics in an average living room is far from unachievable. The gist of the problem however, does not lie in a miraculous voodoo product (be its shape a saucer or a little cube), whose declared parameters should mostly belong to an universe different from ours. The objective of this article is to acquaint the vigilant reader with the basics of acoustics in a closed space. The field of acoustics is complex and quite voluminous. The article summarises advice and tips for improving acoustics of your room, from the basic ones to the more elaborate ones, which even require a knowledge of some basic theory associated with sound behaviour. We wish you a pleasant read! In literature, an ideal listening space or listening room is referred to as acoustically balanced room. The ideal lies in the fact that all audible frequencies have absolutely identical volume level and identical duration of reverberation. Having an acoustically balanced room is essentially impossible and being close to the ideal not at all easy. Things to consider include how close does one want to get, what concessions is one prepared to accept when it comes to interior design and how large an investment is one prepared to lay down for the benefit of improving one’s room acoustics. Acoustic characteristic of a listening space is determined by its size, width, length and height ratio, further by acoustic materials in the space, their volume and acoustic qualities. Sound waves travel from a source to a listener either directly, or as reflections from walls, ceiling, floor and all objects. The balance between the direct and reflected waves, their time delay, density, etc. define the overall character of the listening experience and the acoustic behaviour of the space. The entire audible spectrum (20 Hz to 20 kHz) is taken into account here. The positioning of the speakers and the listening spot in regards to the listener and the given space is just as important. Choose a room whose dimensions (length, width, height) are not identical or do not form integral multiples. Choose the power of your sound apparatus adequately to the size of the listening space. 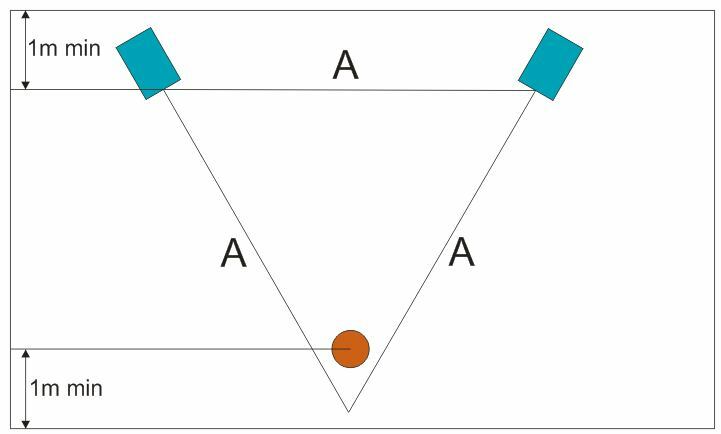 The distance between the speakers and the listening spot should form an equilateral triangle. Place the speakers symmetrically to the listening axis. Do not place the speakers directly in a corner, nor very close to the front wall. Direct the axes of the speakers towards the listening spot so that they intersect about 1 m behind the spot. The listening spot should not be directly by the back wall, but rather at least 1 m away. With side walls, take care about symmetry of any acoustic treatment. Add acoustic materials into the space to optimize the duration of reverberation. Eliminate unwanted reflections (e. g. from a window in the side wall). Suitable composition of different acoustic materials ensures their effectivity. Beware of plasterboard, wooden panelling, etc.—they tend to work as board resonators. Length, width and height should not be the same, nor form multiples. A room of 2.5 x 5 x 5 m, for example, is not exactly ideal, listening-wise. In every axis of a closed space (length, width, height), resonance frequencies and their harmonic multiples are formed. It is desirable that these resonance frequencies are different in a room. If the distances between opposite walls are the same, or form a multiple, their resonance frequencies formed in individual axes will also be the same. Their effect will therefore add up. More does not mean better and it applies twice as much with the power of a system for home listening. Quality listening is balanced with reasonable volume levels. Then one can easily listen for hours. Sensitivity of the speakers is the key here. Sensitivity stands for acoustic pressure in decibel (dB) that the speakers attain at the frequency of 1 kHz, in the distance of 1 m. To demonstrate on our Evolution horn speakers with a sensitivity of 98 dB: for a 50 m³ (5 x 4 m) room, an amplifier with the power of 1 to 2 W is very much enough. The lower the sensitivity, the higher the power needed to excite the speakers. To increase the volume by 3 dB, double the power is required from the amplifier. Speakers with a lousy sensitivity of 83 dB will need the power of 32 W to get to 98 dB. With usual multi band (n-way) speakers, the most energy is used to excite the woofer. This is due to the size of the driver membrane. Every pair of speakers is optimized for a certain volume level by the manufacturer. When listening at low, high and very high volumes, multi band speakers behave differently. The pleasing loud sound with overly elevated bass experienced in the store changes with low volume listening at home. Now there is a twitter of the highs and the woofer seems to be motionless. Increasing the volume will move the woofer, the speakers are now dynamic, but listening to such high volume levels is simply impossible for longer periods, at least without damaging one’s hearing. For standard room sizes, the volume of 100 to 103 dB 1 m away from the driver is plenty. We can calculate the required power of the speakers and the amplifier. Keep it reasonable. Speakers, or their membranes should not be closer than 1 m to a wall (0.5 m is the minimum). The same applies for the ears of the listener at the listening spot. The vertex of an equilateral triangle formed by the axes of the speakers should be behind the listener’s head. The single most probable problem of small rooms (30–40 m²) is an overly large portion of the bass component. The frequency of 345 Hz for example has a wavelength of exactly 1 m. To damp it, a distance of 1/4 of the wavelength is needed—25 cm. A thick curtain hanging 25 cm away from the wall will be suitable here. An overly damped room sounds oppressive, an undamped room has an echo. The ideal is somewhere in between. Searching for the ideal in a furnished living room is a long way full of compromise. Usually, the easiest help is a thick curtain in a corner here and there, moving the closet a bit, etc. If one of your speakers is placed directly in a corner, it will play more loudly. Move it by 10 or 20 cm and compare. Further on, some technical terms, such as decibel, reverberation, half wave, resonance, interference and similar are used. A person untouched by the theory of acoustics can find further insight into the unknown terms in the article Acoustics Theory – Sound Behaviour in Closed Space. Our goal is clear—to get as close to the ideal of the acoustically balanced room as possible. The duration of reverberation should fit somewhere between 0.25 and 0.5 s. Therefore, we shall not do without measurements. Using a mobile phone, some basic measurement of frequency characteristic is achievable. However, to obtain proper reverberation measurements, we will need a laptop or a PC, a connection to the audio system and a microphone. To gain approximate measurements, just for orientation, expensive calibrated equipment is not necessary. Measuring frequency characteristic of a room using a mobile phone will suffice. Frequency meter apps, such as Spectroid will help. The precision of the obtained data then stands and falls with the quality of a microphone used in the mobile phone. The measurement is performed in silence, as great as possible. We feed the speakers with a signal, at an adequate listening volume level. A suitable signal is either white noise (download here), or a so-called sweep signal (download here). These signals cover the entire audible spectrum with the same volume level of -3 dB. The resulting frequency characteristic at the listening spot should be as balanced as possible. If we perform multiple individual measurements at different places in the space, we will be able to observe differences in the results. These differences occur due to interference, resonance and their harmonic frequencies. Note that using a mobile phone, only the room frequency characteristic is measurable, not reverberation. To measure the reverberation characteristic in a listening room, we are going to need a microphone (ideally designed for measuring—calibrated), laptop or a PC and a connection of the audio output and the amplifier. The most frequently used software is probably REW (Room EQ Wizard) (available for free here). Measuring reverberation is only one of the functions this clever program encompasses. The microphone for measuring is placed at the listening spot (head of the listener). A menu in the upper left corner offers a Measure button, in the following dialog box, you set the PC signal volume, measuring time and frequency span (to 20 Hz–20 kHz). The shortest measuring time will do in the beginning. REW will calculate the reverberation time for each frequency using its own signal generator and the microphone input. The result is a waterfall graph, which shows signal intensity in dB on the vertical axis Y in relation to frequency (on the horizontal axis X). The Z axis offers a 3D representation of the duration of reverberation. This value should ideally be the same at all frequencies. All mechanical systems have their natural resonances. In a room, sound waves affect each other. As a result of that, any enclosed space has its resonance frequencies, which are determined by the size of the space and its geometry. Fundamental resonance frequencies Fr have their modal multiples (space functions the same way with both). On the three peaks in the graph, we can see resonance frequencies of a room that correspond to its size Fr=345/2L. 39.9 Hz correspond to the distance of 4.3 m.
55 Hz correspond to the distance of 3.16 m.
75.3 Hz correspond to the distance of 2.3 m.
92 Hz is a fall, which we can treat, in part by moving the listening spot or the speakers. REW is capable of calculating the resonance frequencies including their modal multiples. Thanks to this simulation, it is possible to find an optimal listening spot and speaker placement more quickly. Note that all the calculations can differ from reality due to room furnishings, etc. The program simulates the room as if it was a simple regular cuboid with no windows. In the image above, we can see a simulation of a 5.1 x 5.3 x 2.4 m room and its modal frequencies up to 200 Hz, with a particular setup of the speakers and listening spot. Moving the speakers or the position of the listener with a mouse, the frequency characteristic is immediately recalculated. Doing so, we can get an approximate idea of how will the behaviour of the room change when the position of the speakers or listening spot changes. Sound spreads from its source in waves—the effect is similar to a stone thrown into water. The difference is, apart from air in place of water, that sound spreads in all directions, plus there are reflections. Acoustic materials include all materials that come into contact with air in a given room. Sound waves reflect from the materials. A reflected wave is always of lower energy than a direct one. The basic property of acoustic materials is their ability to damp acoustic energy. Soft materials damp acoustic waves a lot (carpets, curtains, upholstered sofas, pillows, etc. ), hard materials damp waves only a little (a concrete wall, glass, tiles, etc.). Special materials designed to improve acoustics are available. With these, the manufacturer lists their absorption values and frequency characteristic. Selective properties of these materials can be used for different frequency ranges, e. g. materials for ceilings. It is important to understand different functions of acoustic materials and their efficiency in relation to frequency. Many amateur hifi hobbyists believe that more is better, especially under the influence of heavily advertised commercial offers. They buy a large amount of acoustic foam panels, the cheaper the better, and stick them up, covering as much surface as possible. An overly damped space with minimal reverberation is the opposite of a cave with an echo. In such a space, the tendency is to shout, not talk, it feels oppressive and musical instruments do not sound natural. We need to find out which wavelengths we want to suppress and calculate thirds of these lengths. Acoustic foam with 5 cm high spikes will work on frequencies of about 1.7 kHz. Those are highs. is the opposite of an overly damped space. Imagine a glass wall overlooking the garden, glass table, tiled floor, concrete ceiling. Minimalist furniture with flat surfaces, chairs with no upholstering. Every word is heard repeatedly, we can feel pain if but a glass or a teaspoon clinks. Such a place, at least from the acoustic perspective, intuitively feels more like a cave—once again a place we do not wish to be in. From the point of view of acoustics, the proportion between a space that is overly damp or not damped at all is defined by reverberation. That is why measuring reverberation is important to us. An average living room with a carpet, upholstered sofa, bookcase and curtains, will always sound better than a space which has no damping or too much damping. However, any space has its resonance frequencies and their multiples. Phenomena like interference, which was already mentioned, apply here. Due to these, the frequency characteristic is different at different spots in the room. With lower frequencies, sound behaviour is clearly determined by room proportions, placement of speakers and of the listening spot. Generally speaking, it is better to have the speakers placed at least 0.5 m away from a wall, outside a corner. The same applies for the listening spot where the distance from a wall should ideally be 1 m or more. What Will the Frequency Characteristic of Reverberation Tell us? Based on the dimensions of a room, we can divide the frequency characteristic into different sections and choose a composition of acoustic materials accordingly in order to suppress the reverberation on unwanted resonance frequencies. The ideal starting point is to measure in an already furnished room. This will be elaborated on further, on a practical example of a fictitious room with the dimensions of 3 x 4 x 7 m.
The wavelength of audible frequencies (20 Hz to 20 kHz) corresponds to the distance of 17.25 m to 1.7 cm. Half waves therefore correspond to 8.625 m–0.86 cm. This range in proportion to the room size is vital. What applies here is the aforementioned phenomena—resonance, standing waves, etc. on low frequencies, diffusion on higher frequencies. Apart from that, there are also reflections and interference. To maintain some clarity, let us divide the audible spectrum to four frequency sections: A, B, C, D. And further, to a section of low frequencies where acoustic waves model has to be utilised, and a section of higher frequencies where ray acoustics (the angle of impact equals the angle of reflection) applies on a larger scale. consists of very low frequencies, which occur below the boundary of natural room resonance frequency, that is lower than Fr=345/2L. Fr is the resonance frequency, 345 m/s is the speed of sound, 2 stands for half wave and L is the longest distance between opposite walls in the space. Frequencies lower than Fr are not affected by resonance. Even if they exist in the space, they will not be amplified due to the influence of resonance, and so we do not have to take them into account. In our fictitious room, Fr=345/(2*7) = 24.6 Hz. includes frequencies whose wavelength approximately corresponds to the dimensions of the room. The lowest frequency limit is given by the lowest resonance frequency of the space Fr=345/2L. An approximate upper limit is defined by a so-called Schroeder Frequency, which is calculable using this equation: Fs=2000*√(RT60/V). The Schroeder Frequency defines an approximate boundary between reverberation behaviour in a space and discrete behaviour of a room. Our fictitious room has the size of 3 x 4 x 7 m, therefore the volume of 84 m³. Let us presume a reverberation duration of 0.5 s. Then the dividing frequency Fs=2000*√(0.5/84) = 154.3 Hz. is a transition between section B, where the wave acoustics model has to be applied, and section D, where it is possible to apply the simplified model of ray acoustics. The left boundary is defined by the Schroeder Frequency, the right boundary by its quadruple. In section C, wavelengths that are either too long or too short to use the ray model, or wave model respectively, prevail. is an approximate boundary from which on the ray model can be applied. In our fictitious room, Fd=4*Fs = 4*154.3 = 617 Hz. Fd covers higher frequencies whose wavelength is too short for the application of geometric acoustics. In other words, a reflection angle rule is applicable, just as a presumed track of sound. Section D will therefore be limited by the Fd frequency of 617 Hz from the left and the boundary of audibility from the right. Considering sound behaviour in closed space, we have divided the audible spectrum into four sections. For our fictitious room, we have defined the dividing frequencies between these sections. Section A – 0 to 25 Hz corresponds to the wavelength of 7 m and more. Section B – 25 to 154 Hz corresponds to the wavelength of 1.12 m to 7 m.
Section C – 154 to 617 Hz corresponds to the wavelength of 28 cm to 112 cm. Section D is then the frequency of 617 Hz, corresponding to less than 28 cm. We do not treat section A—in a small space, we are not even able to do so. For section B, basstraps and resonators are suitable. For section C, diffusers are appropriate, for section D absorbers. We again note that what is essential here is real measuring of duration of reverberation in relation to frequency. Based on the measurement results, we choose frequencies that need to be addressed and we treat them. In our example, reverberation needs to be suppressed on low frequencies (see the area marked with a circle). Understandably, we need to approach every furnished room individually. For aesthetic reasons, some acoustic treatment is acceptable, while other is not. In our example, we will need a soft, acoustically absorptive material, such as foam basstraps, heavy curtains, or similar treatment. Foam mattresses are not an option because of their closed cell structure. 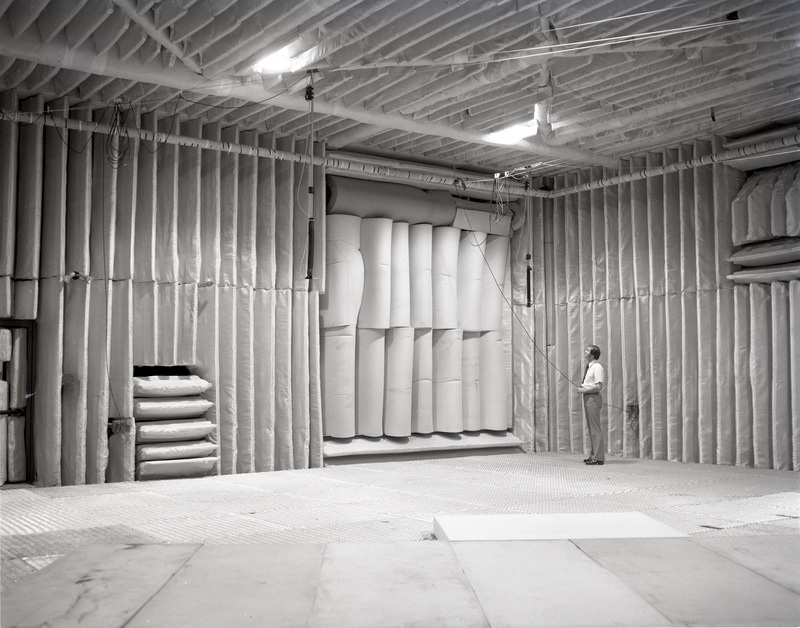 Acoustic or filtering foam with open cell structure is needed. To dampen low frequencies, it will be most efficient in the corners of the room. A curtain can be hanged in a corner, from the ceiling to floor (even if there will be no window behind the curtain). In the end, the result can even be aesthetically interesting. Imagine approximately 5 m of curtain pulled off in the corner. Moving it a bit away from the wall, the damping effect will increase. The thicker the curtain (more weight), the better. The foam treatment should be at least 40 x 40 cm wide. A square cross-section of the basstrap will be more efficient than a triangle one, but it will take up more space. The acoustic foam can be placed vertically into the corners, or also horizontally by the ceiling or floor. The degree of damping achieved depends on the amount of acoustically absorptive material. In practice, the amount needed is determined by estimation. In our case, we need to suppress lows—the bass component with high energy. For the room of 3 x 4 x 7 m = 84 m³, approximately 1–2 m³ of damping material will be needed so that “something happens”. Physics works. If we furnish a completely empty room with a carpet, furniture and curtains, we will certainly notice differences in acoustic behaviour of such space. A carpet effectively means acoustic absorption. The shape of a room (a cuboid) has been made more indented with furniture, which means acoustic diffusion. Although furniture has the ability of absorbing sound and works quite well with high frequencies, it has its limits with low frequencies due to their wavelength. Just how much absorption of acoustic energy will be achieved is dependent on the type of material, its surface size, thickness and density. Thickness and density of a material directly influence absorption of low frequencies. For effective sound absorption using a porous material, the recommended minimal thickness of this material is 1/10 of the sound wave wavelength. Absorption is most effective with 1/4 of the wavelength. Studies show that material thickness is of greater importance with low frequencies. With higher frequencies, the increase in absorption in relation to material thickness in negligible. The effectivity of sound absorption is dependent on the position and placement of the absorption materials. When using multiple absorbers, it is desirable to place them at the ends, sides and ceiling of a room in such a way that all axes are affected by them, ideally symmetrically. With rectangular rooms, absorption materials are most effective close to the corners. When used in corners, such material may be twice as efficient than if it was used in the middle of a wall. Increasing a gap between an absorption material and a wall, absorption coefficient of the material is also increasing. With the increase in distance between an absorber and a wall, the ability to absorb shifts from highs and mids to lower frequencies. Moving a heavy curtain away from a wall will cause its maximal absorption to shift towards lower frequencies. The ability to absorb acoustic energy is measured using absorption coefficient alpha α (has the value of 0 to 1.00). Zero represents zero absorption (complete reflection), 1.00 complete absorption of sound impact. αw is calculated according to the ISO standard 11654.
is calculated according to the ASTM standard C423 and provides an evaluation of sound absorption in a single number (higher values are better) at the expense of less accuracy in comparison to αw. It is a mathematical mean of measured coefficient of sound absorption at the frequencies of 250, 500, 1000 and 2000 Hz. Is the entire project still on paper, or is the room already in place? When deciding about ratio of proportions in the room, do so with regards to resonance frequencies. Decide about the ideal placement of the speakers and the listening spot. Ensure that acoustic properties of the side walls are symmetrical. If the floor is to be reflective (tiles, parquet), treat the ceiling with acoustically absorptive material, in moderation. Large glass planes should always be supplemented with thick curtains, which allow for these areas to be covered during listening. Strive to put diffusion material behind the listening spot, ideally a diffuser or an open bookcase, which will not absorb sound waves, but diffuse them according to the uneven surface. Each specific situation has to be judged individually. How much are we able to sacrifice for the benefit of better acoustics? Is moving the speakers and the listening spot to an ideal place possible? Is it possible to change the configuration of unsuitable furniture, move it or replace it? What are our financial possibilities? 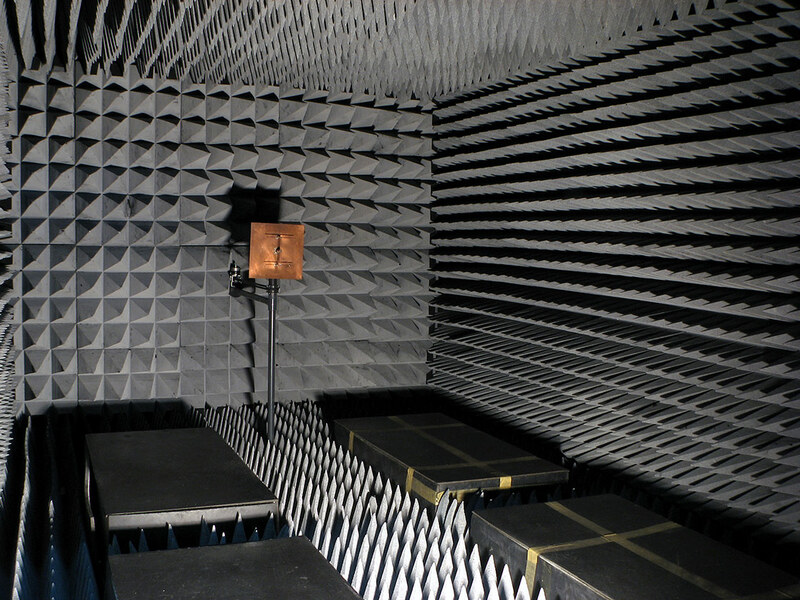 Always base the treatment on measurements of reverberation, according to whether more acoustically absorptive material is needed or less of it. If the ceiling is concrete and the floor is reflective as well (tiles, linoleum, parquet), use a thick carpet for the floor. Place aesthetically acceptable acoustic material on the ceiling. Damping lower frequencies is most effective in room corners. If the listening spot must be very close to a wall, damp the area behind your head as much as possible. Use thick curtains for reflective glass surfaces. The distance of a curtain from a wall defines the frequency on which the damping will be most effective. Beware of plasterboard, decking on the ceiling and partitions. If they are mounted using a wide grid, they tend to behave similarly to board resonators. They can be damped by filling the cavities with wool or mounting foam. It is recommended to place acoustic foam effective on low frequencies in the corners of a room (event the floor and ceiling corners, not only the vertical ones). Flat hard materials, such as glass are not suitable between the speakers and behind the listening spot. Windows, flat walls or cabinets are not suitable. Between the speakers and behind the listening spot, diffusion materials are convenient (an acoustic diffuser, open bookcase). Side walls are best off with more reflective materials for mid and high frequencies. Symmetry of acoustic treatment is important here. The ceiling should be (partly) absorptive. The back wall is then absorptive or diffusive (an acoustic diffuser is again ideal). The floor is partly reflective or absorptive. The gravest mistake of a disappointed audiophile is placing an expensive system in an empty room. On the other hand, excessive damping is also wrong, especially on high frequencies. Generally, a suitable curtain and sane amount of acoustically convenient furniture will suffice. In an average sized room, we should first try to suppress low frequencies, then the mids. High frequencies suppressed very easily. In small rooms, the amount of low frequencies is usually excessive—the music has too much bass. Low frequencies have long wavelengths (e. g. the wavelength of 40 Hz is 8 m). Due to reflected waves, interference with other waves occurs. The result is that compared to other frequencies, low frequencies sound either louder or weaker at some points in the room. Ratio of room proportions largely influences acoustics, as it defines resonance frequencies of the room.